Aerohive Networks has announced a new family of access points based on the 802.11ax standard. The company has also announced the Atom AP30, a small AP that can be plugged into a standard power outlet. 802.11ax, which is expected to be ratified in 2019, aims to boost the efficiency of APs to enable them to serve more clients with more consistent performance, particularly in dense environments such as stadiums and airports. The Aerohive 11ax APs (models 630, 650, and 650X) are expected to ship in Q2 or Q3 2018. Pricing starts at $1,199. The 630 and 650 models have internal antennas, while the 650X has external antennas for deployment in warehouses or auditoriums. The APs support both the 2.4 and 5GHz bands. The 650 and 605X models include a fixed 5GHz radio and one radio that can be programmed via software for either the 2.4 or 5GHz band. The APs also support BLE for Bluetooth beacons. The 802.11ax standard has a variety of new features and capabilities that improve on 11ac. These features should be available in any standard-compliant AP. Here’s a few that stand out. Enhanced MU-MIMO: Introduced in 802.11ac, MU-MIMO enables an AP to communicate with an ad hoc group of clients simultaneously. The 11ax standard enables up to 8 simultaneous connections, double that of 11ac. In addition, MU-MIMO in 11ac could only be used to transmit simultaneously to receivers (downlink connection). In 11ax, APs can transmit to and receive from simultaneous devices (downlink and uplink connections). However, MU-MIMO can add overhead in the channel and consume processor and memory resources on the AP, as well as add noise to the overall environment. OFDMA: OFDMA (Orthogonal Frequency Division Multiple Access) carves existing channels of 20, 40, 80, and 160MHz into smaller sub-channels, which can then be assigned to clients. The upshot is that an AP can serve a greater number of clients simultaneously by parceling out smaller slices of a channel, rather than having a fewer number of clients contend for larger slices. Up to nine clients can share a 20MHz channel. Note that clients must support the 11ax standard, not just the APs, to take advantage of OFDMA. While 11ax APs will be backwards-compatible with older clients, the efficiency gains enabled by OFDMA won’t be realized until smartphones, laptops, and other mobile devices have 11ax chipsets. 1024-QAM: QAM modulation has gone from 256 to 1024 in the 11ax version, which means increased throughput. Target Wake Time: Target Wait Time (TWT) is a new feature in 11ax. It enables APs to schedule when an end point device such as an IoT sensor will connect and send data to an AP. This feature can save battery life in sensors and reduce contention. There are other enhancements to the standard as well. There’s a great overview here if you want more details. And Divergent Dynamics has a good blog on what 802.11ax isn’t going to do for you. 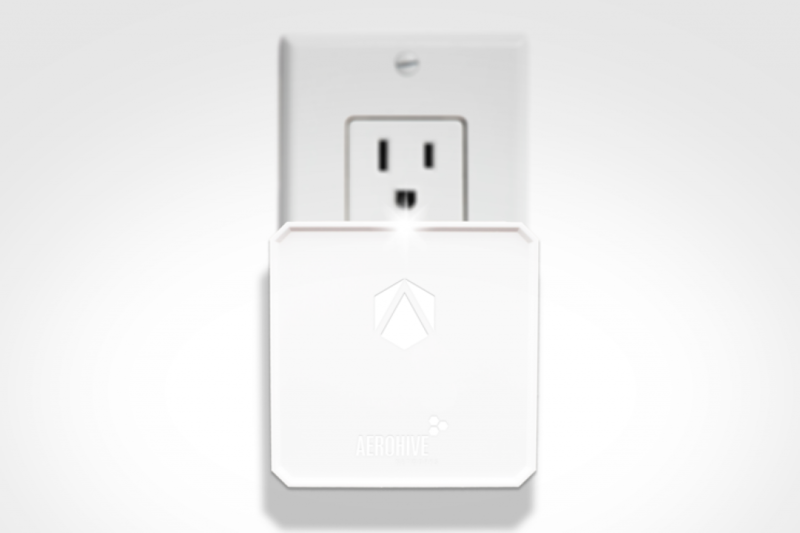 Aerohive is also announcing the Atom AP30, a small form-factor access point that can be plugged into a standard electrical outlet. The goal is to provide an AP that can fill dead spots in an enterprise WLAN, or provide connectivity to kiosks and other remote locations. The Atom AP30 is an 11ac AP with 2.4 and 5GHz radios. When you plug an Atom AP30 into the wall, it will automatically join an existing WLAN network via Aerohive’s mesh technology, or it can be plugged into an Ethernet cable. The Atom AP30 is $599 plus a software license for a pack of three APs. The Atom AP30 will be available Q2 2018.